I identify primarily as a realist figure painter. 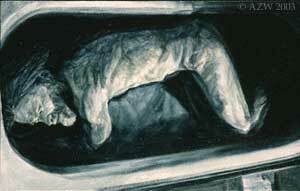 Although some of my figure paintings are narrative, most are snapshots of psychological moments and transitions. I also paint colorful landscapes which tend to be more expressive than naturalistic. Photography plays an important role in my work. I take photos to deepen my understanding of the themes I explore in my art. I generally paint the figure paintings from photos but paint the landscapes on location. You can read more about how I think about my work in my artist's statement and by following the links at the bottom of this page. If you'd like to know about upcoming exhibitions, please send me your address. Most of the art works displayed in the galleries in this site are for sale. I teach workshops for adults and college classes in painting, drawing, and art appreciation. Two of my most popular workshops are "Drawing for Nincompoops" and a kid-art class for adults called "Squish, Splat, Scratch, and Splot!" If you'd like to host a workshop, please contact me. My primary research interest is prehistoric art, particularly that of the Franco-Cantabrian region. At the western end of the Franco-Cantabrian region lies Asturias, a land of green mountains and rocky seacoasts which was once an independent kingdom and is now a Spanish province. 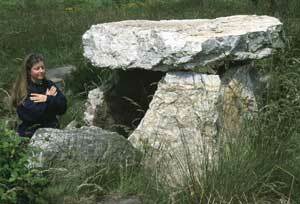 Earlier yet, Asturias was the home of remarkable Paleolithic, Neolithic, and Bronze Age cultures. Given that my mother's family is Asturian, I also enjoy learning about the people, foods, music, and history of this region. In my free time I play rhythm guitar and bodhran in Celtic and traditional folk music groups. I now live in Pasadena, Maryland. I've also lived and worked in Baltimore, MD; Hanover, NH; Washington, DC; rural southwest Virginia; Cedar Falls, IA; Chicago, IL; Madrid, Spain; Morgantown, WV; and Pella, IA.